Student Choice High School has been established to serve the needs of a variety of learners. We provide an intimate setting with a student to staff ratio of 15:1 where our staff and student performance continue to gain momentum in our pursuit of education excellence. The environment we have created is conducive to students who are having difficulty finding success in a traditional school setting. Our top priority is to motivate students to re-engage with and be in control of their own academic outcomes. We provide a unique and flexible learning experience for our students in which highly qualified staff members are present and available to provide the instructional, social, and emotional support for our students. This is combined with a standards-based online curriculum, which allows for self-pacing, individualized progress monitoring, and assessment tools to measure student success. Upon student re-engagement, our focus becomes sequential steps toward both graduation and successful post-secondary opportunities through college and career readiness. 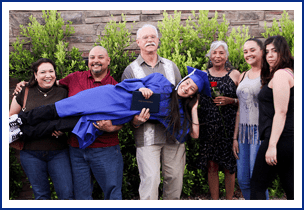 Student Choice High School is an AdvancED accredited institution which provides necessary and appropriate course placement and sequencing, guidance support, and post-secondary measures through AzCIS. Most importantly, we exist to assist students in navigating their way toward a high school diploma. "I am extremely happy to have found your school, I just wish I would have found SCHS a lot sooner! This has been the perfect program for my child. Thank you so much for all you do! Read More >>>"
“We have witnessed a transformation with Student Choice over the past years and have watched this program go from only a few students in one classroom to over 300 students, in multiple classrooms, with multiple educators. The program is driven by your educators, and we appreciate their passion on a daily basis. Thank you for assisting us in being a beacon of hope in our community. We are excited for the future! Read More >>>"
- Jowharah N. Hall, Integrity Hearts, LLC. At Student Choice High School, it is our mission to motivate students to come to school and learn every day, to educate students using the best possible curriculum and highly qualified staff, and to graduate students into a successful, productive, and exciting future. Our students want to be here. They come to school each day to learn in a uniquely self-paced environment. Our student-teacher ratio is approximately 15 students for every 1 teacher, offering each student a personalized learning experience. Credit is earned by subject mastery, not seat time. The curriculum is self-paced and delivered through a computer-based software. Student Choice teachers focus on each individual student’s needs and plan lessons accordingly. Our curriculum adheres to state standards and is designed to help our students learn and prepare for the standardized tests they must pass in order to graduate. Once enrolled, our dedicated staff helps each student build a personalized graduation plan. What’s more, we want to expose our students to the endless possibilities that await them after receiving a high school diploma. Our staff works with these young adults to realize their interests upon graduation and discover what opportunities are available to them.